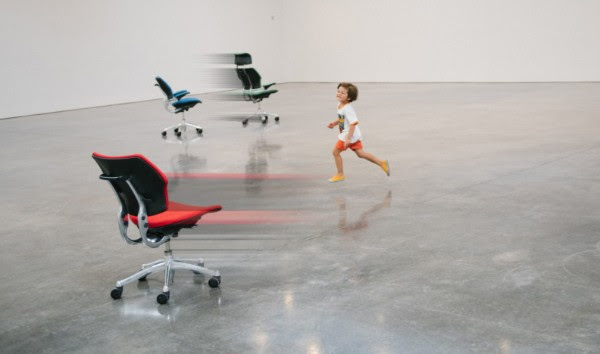 9 office chairs move throughout the gallery BY THEMSELVES - performing a coordinated dance (sometimes together, sometimes in pairs) without ANY visible mechanisms. It's easy to describe, but impossible to believe. No strings, no magnets... just living chairs. It's as if there are invisible dancers in the gallery moving chairs. AND!! If you walk among them, they know where you are and will not run into you. (which will screw up the dance if there are too many people in there). This is some kind of next-level "self-driving car" technology that I've never seen. In fact, I was SO blown away, that I never pulled out my iphone to take a picture/video - which is a unprecedented state of amazement. So the images above were taken from the artist's website if you want to see more (taken by Chad Moore), but I added the blurs in Photoshop to better represent the movement. I'll take some video for Instagram next week.